"Wooaahh"..thats what my hosts said when I told them I came riding from Bengaluru to Coorg. 280 kms on bike was not that far a ride was my response with a smile. I have always loved my bike rides and I would like to add this trip of mine from Bengaluru to Coorg on my list of favourites. Reached Madikeri by lunch time after leaving Bengaluru at 6.30 am sharp. It was my second trip to Coorg and my first on bike. The roads from Bengaluru till Kushal Nagar were smooth and the ride through the coffee estates till Madikeri was mind blowing. Made Madikeri the base so that other places could be covered easily ( not sure whether that was the right decision as I did miss out on a couple of places). My accommodation was booked at Gowri Nivas, a beautiful home stay in Madikeri. Must say this is a beautiful home stay with wonderful hosts. After a cup of refreshing coffee headed straight to Abbey falls late in the afternoon. It’s hardly 15 min. ride from Madikeri to Abbey falls. You need to walk down through a private coffee plantation from the parking area to reach the falls. It’s a perfect picnic spot for school kids and I found a lot of them running up and down the steps. The steps take you down to a hanging bridge from where you can view the water gushing down. The last time I visited (that’s more than 3years back) the bridge was not there and we could go down to the base of the falls. However this time I had to be content with the view from the bridge. Known for its mesmerizing sunset viewpoint, Raja seat was the next destination. This point is in fact inside a park from where you get an amazing sunset view. It’s truly a treat for your eyes. Make sure you don’t move places as you have people of all ages pushing you from all sides to have a share of the same treat. Later headed towards the town to check out some nice home-made wines. I was in for a surprise when the shop keeper pulled out a variety of them like rice wine, beetle wine, pineapple wine, apple wine, sugarcane wine etc. With wines for company I spent the night gulping them down. The dinner by the hosts needs a special mention here. It was delicious. Day 2 was set aside for visiting places and I started off with Dubare Elephant camp. It is approx. 35 kms to Dubare from Madikeri. I decided to give my pulsar a break and hired a cab. Avoided the normal Kushal Nagar route and took a deviation into the winding roads through the coffee plantations that take you to the elephant camp at Dubare. A small boat ride takes you to the other bank where you have the elephant camp. Had a lovely time watching the elephants spraying water all over and a few tourists giving the pachyderms a rub on their back. It was fortunate that I visited the camp in the morning itself as it closes by afternoon. The wait for the elephant ride was quite long as there were just two elephants being used for the same. Even though the ride was a small one lasting hardly 15 min., the experience was quite memorable (It’s a royal feeling when you are on top of that giant..!!). From the elephants to the monastries... Yup, that was my next stopage..Bylakuppe, the largest tibetan settlement outside Tibet. The feel of being surrounded by thousands of budhist monks is tremendous. 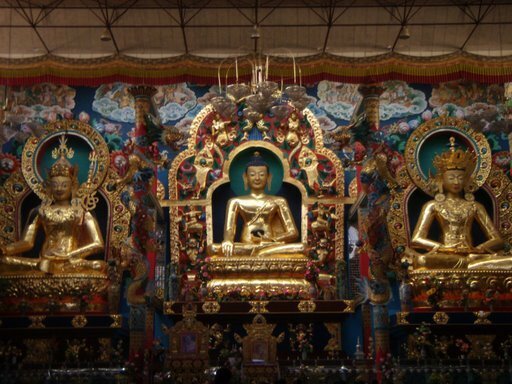 The Namdroling monastery is a must-see for anyone heading to Coorg. The golden statues of Budha inside the monastry give you an exceptional mixture of serenity and solitude. I cant imagine anyone else who has got a more calm face than Lord Budha..!! There are a number of shops outside the monastery from where you can purchase a few tibetan artifacts. That was it for the day and headed back to Madikeri in search of a traditional Kodava knife. I was quite disappointed that I could not find one anywhere. Late evening again ventured out hunting for more wines and picked up a couple of them. Tasted the different varieties of wines and then slept off. It was the new year eve and certainly one of the quietest one that I have had in the last couple of years. As my eyes shut, I could hear a few crackers burst and people shouting, celebrating and welcoming the year 2009. The third day was the return journey back to Bengaluru. The return journey is always long and tiring and this was no different. Mounted on my pulsar and left the home stay by 10 am. Reached Bengaluru by 7.30 pm with many breaks in between, and the one at Barista near Mandya was the longest. With the aroma of coffee, amazing landscapes and hospitable people, Coorg is ideally the best getaway from Bengaluru. Since the time was short and the distances were long, I did miss out on a couple of places like Tandiyamol, talcauvery, etc. @ashwini: a farm house in coorg would be awesome..laid back lifestyle..
Hi , Nice write up! Please advise me on visiting coffee plantation. Do i have to contact owner for visit priorly? @ Naiya.. Thanks for dropping by. You need to inform the owner at gowri nivas in advance before dropping by. The owner does have a coffee plantation. Not sure if he would take you on a plantation tour. I did not go on any plantation tour during my visit. But am sure there are lots of plantation tours organised. Glad you liked it. Head there soon and on a bike. :) It is a lovely ride all the way from Bangalore. You can always go back one more time.. may be post monsoon? Post the monsoons would be the ideal time to head to Coorg. Coorg is one destination that I think I should have covered by now. Anyway, I love reading about it till I make it there. Coorg is absolutely lovely and has a charm of its own. You would love it. That is nice. I am sure it was a wonderful trip. Varkala- The land of cliffs, beaches & bikinis..